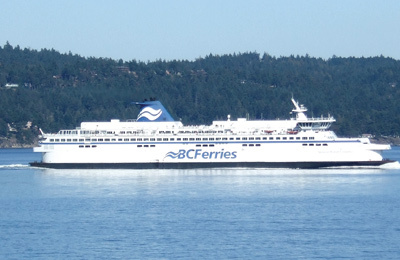 BC Ferries started its ferry services in 1960 with two boats and around 200 employees. Nowadays it's one of the world's largest and most modern ferry companies, offering crossings throughout the year for foot passengers and motorized passengers. Depending on the crossing and the need, BC Ferries has different types of ferries, from the 560 feet long Spirit of British Columbia and Spirit of Vancouver Island that can accommodate up to 2,100 passengers and 470 vehicles, to the 111 feet long Nimpkish, that can carry 133 people and 16 vehicles as maximum. 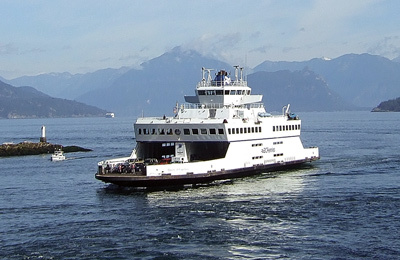 The BC Ferries ships travelling to the Vancouver Islands, the Southern Gulf Islands and the Sunshine Coast offer a wide range of services and facilities, with the type and diversity depending on the ferry. However, all of them have something in common, they will provide a high level of customer satisfaction. On board BC Ferries you will find a variety of food and beverages depending on the ship, from an all-inclusive-buffet, to a self-service restaurant or coffee and snacks. Apart from this, you will also be able to buy memorabilia, magazines and snacks in the on board shop. Relax and enjoy the views from the outer decks or the main lounge areas. Some seasonal departures offer the Seawest Lounge, a quiet space that allows you to enjoy a peaceful crossing. On board there is also entertaining for all ages. You can travel by foot or with your vehicle, BC Ferries takes cars, motorbikes, etc. The BC Ferries ships are designed to make easy and comfortable the crossing to disabled people. If you travel with a wheelchair or use a walking aid, please advise to the ticket agent when you arrive to the terminal so they can let you know where to go. It is recommended to arrive to the terminal with one hour in advance. Your pets are allowed to travel on board BC Ferries, however they will need to stay on the vehicle decks during the crossing, with the exception of guide dogs and certified assistance dogs. There is a hand-bag luggage service available for the foot passengers on almost every route. The maximum weight of each item is 50lbs. The luggage will have to be labelled and carried in an appropriate suitcase or container. Valuable and delicate objects, like sport equipment, are not accepted. How long before departure should I arrive for BC Ferries? Check in time is 2 hours prior to scheduled sailing. Summer only: From the Northern Adventure (Skidegate to Prince Rupert) to Northern Expedition (Prince Rupert to Port Hardy) the cut-off time will be waived for the scheduled Route 10 & 11 connections in Prince Rupert. check in time is 2.5 hours before scheduled departure. check in time is 2 hours prior to departure. From the Northern Adventure (RT 11) to Northern Expedition (RT 10) Summer schedule the cut-off time will be waived for the scheduled Route 10 & 11 connections in Prince Rupert. Check in at the BC Ferries dock a minimum of 60 minutes prior to the sailing time.